On Monday the 21st March staff and students from the University of Exeter and University College London met to discuss the importance of research-based education in a university environment. The Archaeology department, along with History and STEM subjects such as Physics, Biosciences, Natural Sciences and Conservation were invited to this symposium due to good track records of research-led teaching, and teaching-led research. After a 7:30 start, and due to some unrealistically optimistic travel arrangements, the first discussions of the day happened on the bus! We arranged ourselves into mixed subject groups and discussed how fully integrating research and teaching was being tackled in other disciplines. There were some really great examples of good practice from all departments – for Archaeology, we identified that taking students on excavation in their first year involves them in research and encourages participation in research projects in the future. Thankfully, before we all got too travel sick, we arrived at UCL. 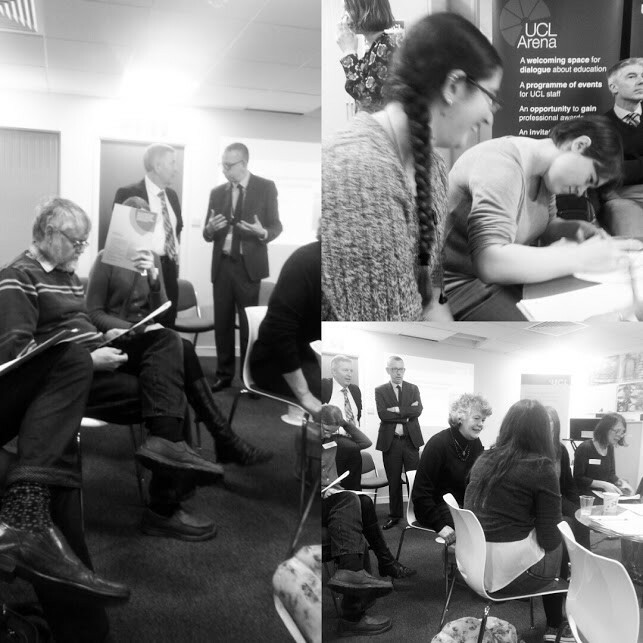 After meeting our counterparts at UCL over some lunch we fed back the morning’s discussions and then separated into our subject groups, after being informed of the hashtag – #ExetermeetsUCL! PhD student Emily Johnson (@zooarchaemily) provided a running twitter commentary of the discussions. Control of admissions being centralised without interviews means academics no longer choose their own students, so there’s no controlling entrance of students that might particularly contribute to a mutual teaching/research relationship (particularly if they do not meet the grade requirements). Lack of resources (funds) and staff time to encourage and support student research projects. How do we encourage ALL students to benefit from the department’s research culture when it is normally the proactive, engaged students that take advantage of research opportunities? What about those that just want a degree, and in the short term don’t really care about the research culture? The “spoon feeding” culture encouraged by making all resources immediately accessible online does not encourage high quality research – or indeed, the kind of graduate students that are valued by employers. Excavation involves students in research in their first year, which engages and enthuses them for their time at university. The community spirit in archaeology is particularly beneficial to creating a positive culture of teaching and research. Practical classes encourage a more casual relationship between students and staff which in turn makes it more likely that they will work together in the future. A research community that involves ALL students at all levels (UG, PGT, PhD) and staff is mutually beneficial to all parties. After meeting in our disciplines we fed back to the main room, where other disciplines had identified similar issues. We came away with a better understanding of what it takes for a culture of research-led teaching to thrive, and how important the synergy of research and teaching is to a university environment. It provides a better student experience and more employable graduates, let alone the fact that it allows for world class research and the furthering of human knowledge. Emily Johnson is a third year PhD student in the Archaeology department studying dietary changes in Neolithic Central Europe (5500-4500BC) through animal bones. You can find out more about her research on her e-profile or follow the most recent updates on twitter.